Silicon dioxide is known as Silica , SiO2. 95 % of the earth crust is made up of silica and silicates.It occurs in several crystallographic forms , namely , quartz , cristobalite and tridymite.These crystalline forms are interconvertible at suitable temperature. Silicon dioxide is covalent , three- dimensional network solid in which each silicon atom is bonded to four oxygen which are arranged tetrahedrally around it and each oxygen atom is attached to two silicon atoms by covalent bonds. Each corner is further shared by another tetrahedron.The entire crystal may be considered as a giant molecule in which eight- membered rings are formed with alternate silicon and oxygen atoms. 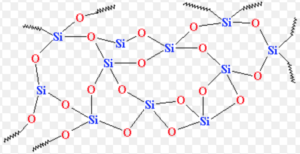 1) Since Si-O bonds are very strong , silica is inert and has high melting point. 2) It does not react with halogens , dihydrogen and most of the acids and metals even at high temperature. 3) It is attacked by F2 , HF and NaOH. Due to the formation of H2SiF6 , SiO2 present in glass dissolves.There HF cannot be stored in glass bottles but is stored in containers made up of copper or metal alloy. 4) Quartz is used as piezoelectric material. 2) By the action of HCl on soluble silicate when gelatinous ppt. of silica gel are obtained. 1) It is used as a catalyst in petroleum industry and as an adsorbent in column chromatography. 2) When (NH4)2CoCl4 is added to silica gel, it is used as a humidity detector since it is blue when dry but turns pink when hydrated.